Threatening to finally exhaust the entertainment news industry’s carefully stockpiled supply of jokes about who one might want to call, big Twinkies, and quitting better jobs than this one, The Hollywood Reporter is claiming that Sony has put an animated Ghostbusters movie into development. Presumably issuing forth from Sony’s merciless Ghost Corps—which is the actual name of the Dan Aykroyd and Ivan Reitman-led team tasked with turning Ghostbusters into a Marvel-esque blockbuster franchise for the studio, since we’re officially too tired to make things up any more—the film is apparently the subject of “internal discussions” right now between Sony Pictures and Sony Pictures Animation. Reitman is rumored to be loosely attached to the project, which appears to be independent from Paul Feig’s Ghostbusters, currently shooting, and the other Ghostbusters movie Channing Tatum said had “gotten messy” in a recent Howard Stern interview. 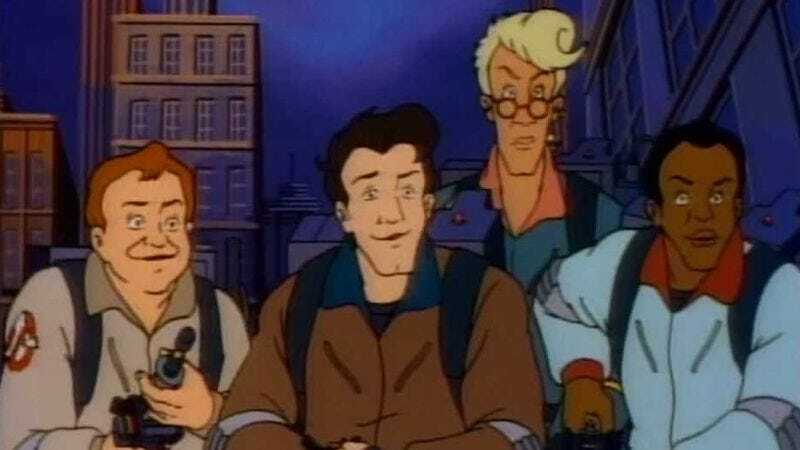 Meanwhile, it’s not like the franchise is a stranger to animation; the ’80s-produced The Real Ghostbusters cartoon continues to hold a warm place in the hearts of fans to this day, although there’s no guarantee that those incarnations of the characters will be the ones to appear in Sony’s hypothetical film. Anyway, it’s official: We have reached Peak Ghosts. Dogs and cats will now begin doing something that was probably pretty funny, 50 Ghostbusters Newswires ago. Also, we’ve just discovered that if you type the word Ghostbusters enough times, it ceases to have any real meaning, a neat trick given that it was a nonsense phrase to begin with. Ghostbusters, Ghostbusters, Ghostbusters.